Remember to enter the wristlet/iPhone case giveaway from ScriptureArt! You can do that riiiiiiiiiight HERE!! Happy birthday to meeeeeeee! You should all vote for my blog today to make me very happy, ok? If you don't vote I'll be expecting a very expensive gift in the mail by Friday. 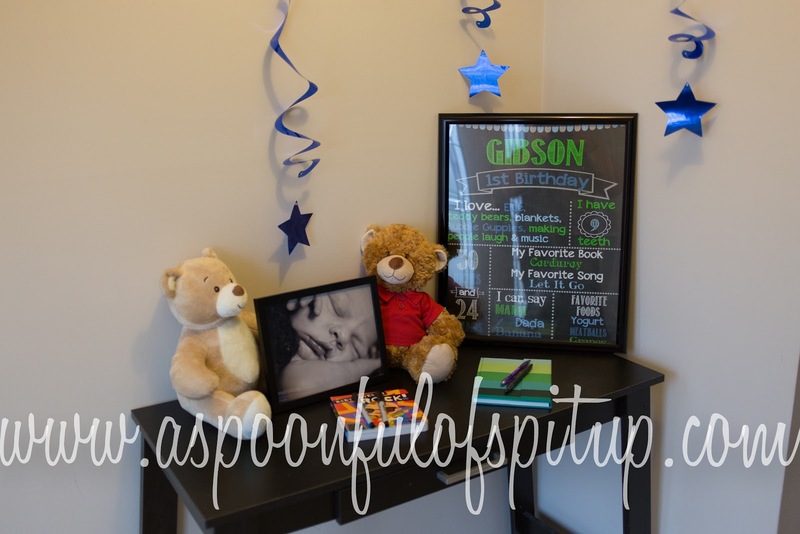 Speaking of birthdays, Gibson's party on Saturday went well! It was so much fun to watch Gibson entertain everyone...it's one of his favorite things! And of course he loved his blue cupcakes and the barbecue chicken I made for lunch. The child loves his food! Months and months ago, I started to plan Gibson's party in my head. I had big, extravagant plans! Those plans never came to fruition, and I'm totally ok with that. If my dream party had happened, my house would have been FULL of decorations. 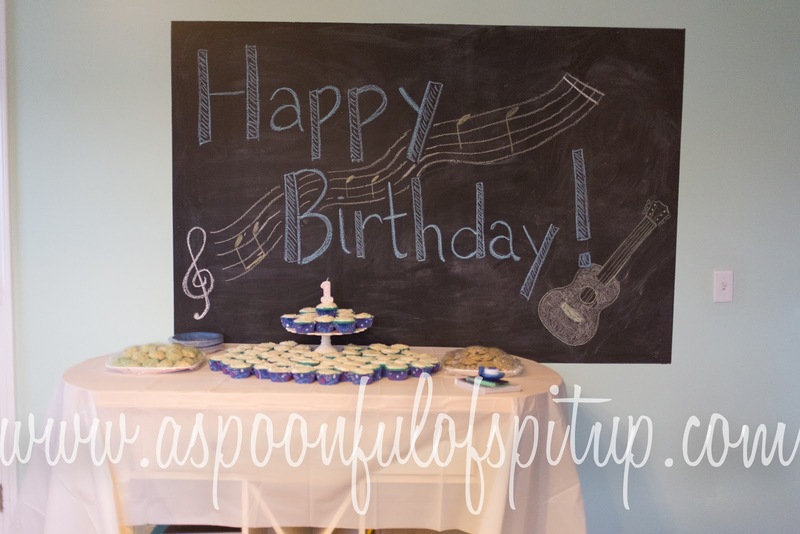 We would have put a big sign outside, balloons everywhere, a huge guitar cake, crafts and activities for the children...it would have looked like Pinterest vomited all over the place, for real. And that's as far as I went with decorations. I know myself, and if I had planned lots of activities and decorated like crazy, I wouldn't have enjoyed the party as much as I did. I would have been worried about whether things were going well, and whether the decorations still looked good. So instead I made good food and enjoyed hanging out with our family and friends. And eating lots of cookies and cupcakes. Nom nom. The entire week before Gibson's party I was super worried that I wasn't doing enough to make it special. I feel like, in this Pinterest-crazed world, parties are expected to be super thematic and extravagant. As much as I would have loved to do a party like that, it just didn't make sense for us. So I put my worries aside and went with the laid back party...and I'm really glad I did! It was perfect for us. I love looking at photos of beautiful parties when other people plan and execute them, but the thought of doing that myself makes me all nervous and twitchy. In the future we may have a more extravagant party for Gibson, but this year it was way more fun to hang out and enjoy myself than to go all out with a crazy party. Gibson didn't know the difference anyway! As long as there was cake, I think he would enjoy a toenail-themed party. Because for real, he loves cake. Remember to vote for my blog! Otherwise I won't invite you to Gibson't toenail-themed party next year. It's BYOTC. ...bring your own toenail clippings, of course. I am SO glad you didn't go for the ultra-themed over the top party. It was perfect. Everyone enjoying each other and fawning over Gibson and talking about what color our poop would be after eating the blue cupcakes. In other words, it was perfect! If I didn't have an intense love for throwing over the top parties I would have so done this. I've been planning and ordering stuff for London's birthday party since he was 5 months old. I'm psycho like that. I agree that Pinterest is taking over our lives! !